In 1984, Chicago artist and community leader Tatsu Aoki founded Innocent Eyes and Lenses (IEL) in response to the need for an organization that was dedicated to presenting Asian American artists and programs that were relevant to the community. Since then, IEL, an Illinois-based non-profit organization, has been a leading force in presenting the Asian American experience through the arts in Illinois. After 20 years of working as IEL, we made the decision to change our name from Innocent Eyes and Lenses to Asian Improv aRts Midwest in 2004. This change was made in order to reflect the community that IEL has been serving since its inception as well as to recognize the partnership that has been established with the San Francisco-based Asian Improv aRts. Founded by musician and community activist Francis Wong, Asian Improv aRts has been a leader in building community through the Asian American cultural arts on the West Coast for two decades and we are honored to be a part of the Asian Improv family. AIRMW has had tremendous success in connecting artists, community organizations and the city’s cultural institutions and has presented programs featuring world-class artistry while remaining rooted in the Chicago Asian American community. 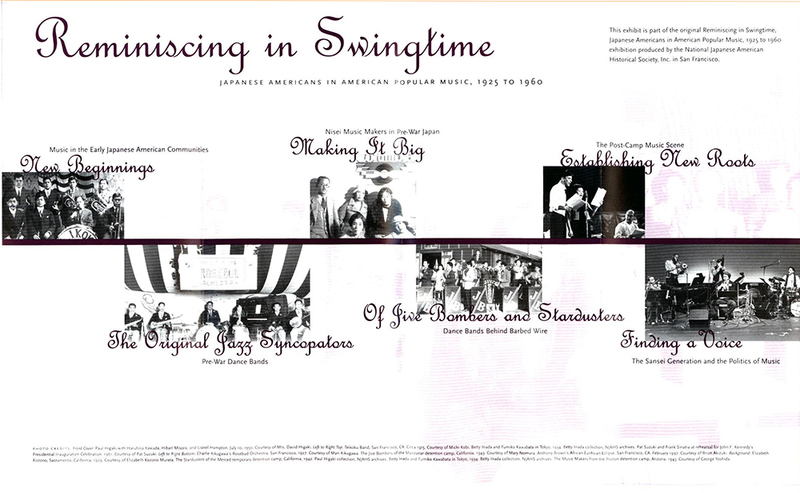 AIRMW has collaborated with and/or received support from organizations that include the Japanese American Service Committee (JASC), the Jazz Institute of Chicago, the Museum of Contemporary Art, the Chicago Cultural Center, the Illinois Arts Council, the Illinois Humanities Council, the Richard H. Driehaus Foundation, the National Endowment for the Arts, the Boeing Corporation, the Japanese Chamber of Commerce and Industry of Chicago Foundation and Meet The Composer among many others. Asian Improv aRts Midwest produces the Fifth Annual Chicago Taiko Legacy at the MCA, featuring two nights of sold out performances, artist residencies and master classes. Guest artists included Chicago’s Ho Etsu Taiko, Fujima Ryu of Chicago, Chicago musician/composer Mwata Bowden, Melody Takata of San Francisco’s Gen Taiko, Bay Area performance artist Dohee Lee, New York violinist/composer Jonathan Chen, and from Tokyo, Japan, shamisen masters Chizuru KIneya and Satomayu Kineya. Asian Improv aRts Midwest co-produces the first Asian American Jazz Festival to take place outside of the US with Asian American Jazz: Poznan. 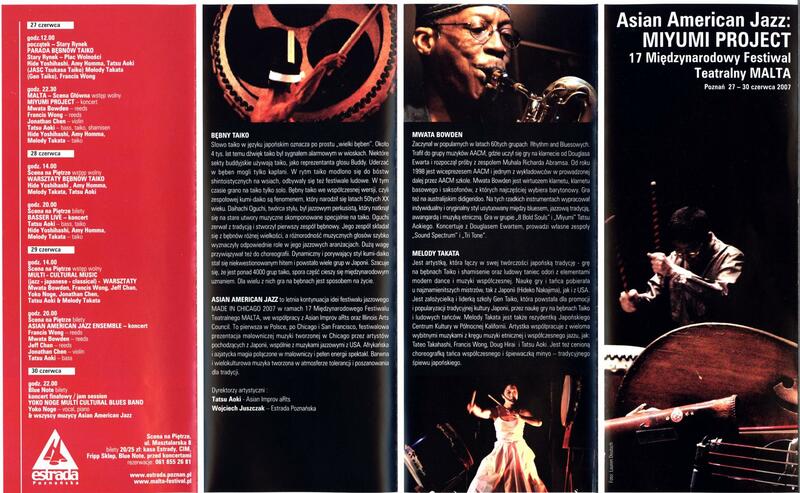 Produced in collaboration with the Malta International Theatre Festival, Asian American Jazz: Poznan featuring 8 Chicago, San Francisco, and European-based Asian American artists and their collaborators. Jay Pritzker Pavilion, Made in Chicago: World Class Jazz, Asia-Chicago. 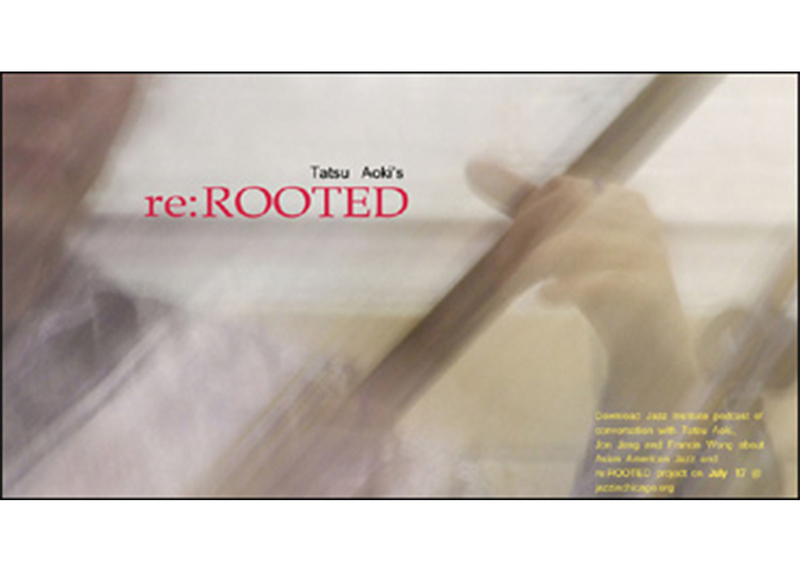 Tatsu Aoki’s re:Rooted Project is the culmination of an exploration of Asian identity and cultural integration in three different communities. Marrying traditional and unconventional musical instruments and forms; the Re:Rooted Project also blends the unique perspectives of older and younger generations of musicians. The concert features pianist Jon Jang and saxophonist Francis Wong. Tatsu Aoki’s Miyumi Project and JASC Tsukasa Taiko travel to Poznan, Poland to participate in the first Made in Chicago: Poland tour. 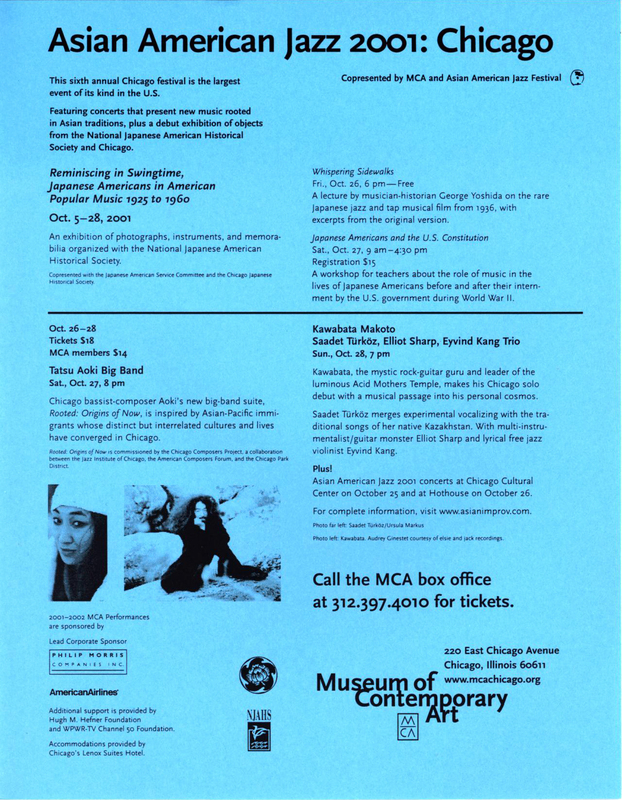 The Miyumi Project and JASC Tsukasa Taiko were part of a roster of over a dozen artists that represented the diversity of the Chicago jazz and new music scenes. AIRMW moves into its new office in downtown Chicago’s historic Fine Arts Building, working closely with the Jazz Institute of Chicago and the Association for the Advancement of Creative Musicians (AACM). 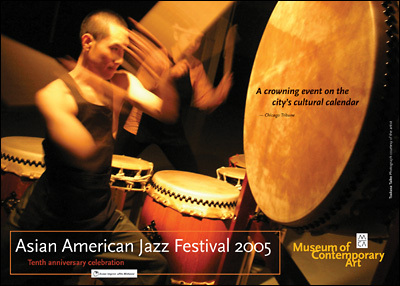 AIRMW produces the 10th Annual Chicago Asian American Jazz Festival, producing over 4 weeks of programs, including the 2nd Annual Chicago Taiko Legacy event, at venues including the Museum of Contemporary Art, the Chicago Cultural Center, the HotHouse and Links Hall. IEL changes its name to Asian Improv aRts Midwest (AIRMW), reflecting its relationship with San Francisco’s Asian Improv aRts. 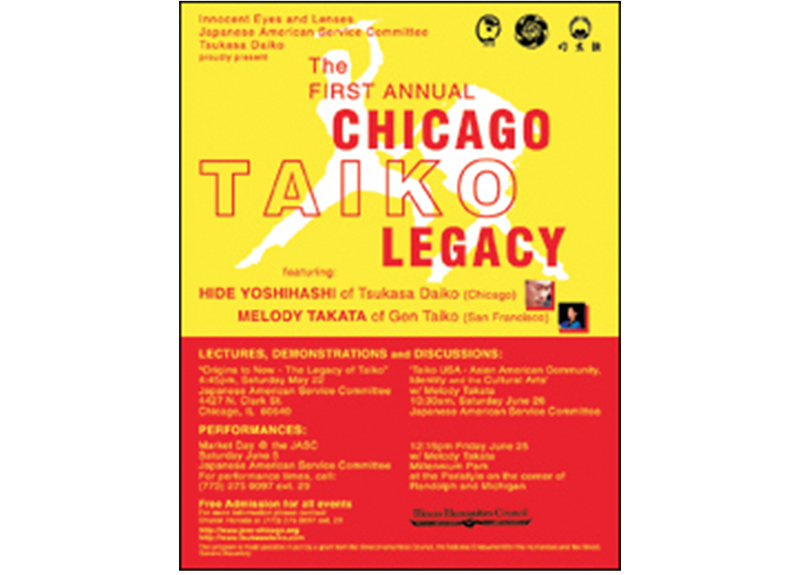 Produced the First Annual Chicago Taiko Legacy event, featuring live performances, lecture/demonstrations and discussions with Chicago’s Tsukasa Daiko and Melody Takata of San Francisco’s Gen Taiko. 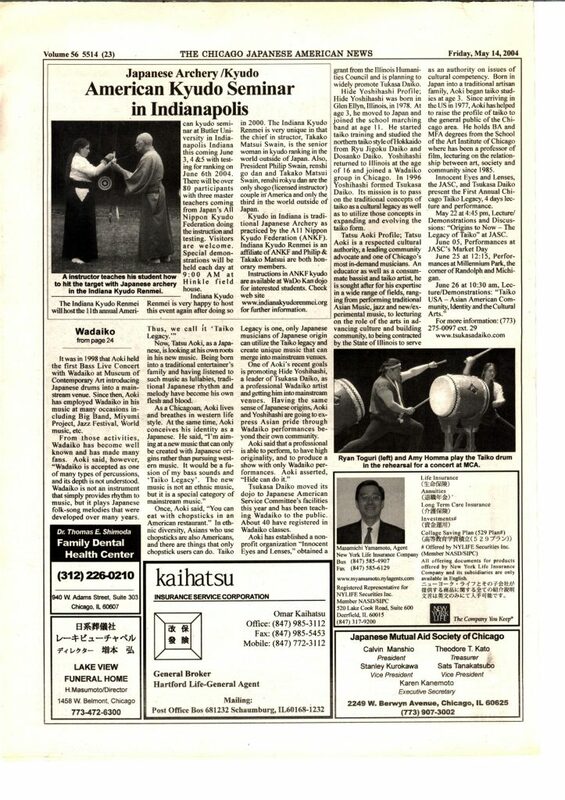 Initiated the JASC Tsukasa Taiko Legacy program, establishing a community-based arts residency at the JASC for teaching taiko (Japanese drumming) and traditional/classical Japanese music.